Is Indian Wells the best tournament in the world to attend in person--or at least in the United States? 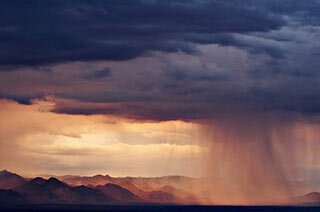 When it comes to the weather and the surroundings, no doubt. When it comes to the level of tennis? It's pretty close there too. It may not be a Slam but it has both men and women, and almost all the top players. But in one aspect, Indian Wells is a dream. The first week there is the best opportunity in the world to watch the top players at point blank range. That's great if you're a fan. But it's even better if you're a player. It's an unparalleled chance to receive a direct technical and emotional infusion of world class tennis. You can take a direct tennis infusion from the great playerson the small stadiums before they are great. The effect on tennis players is almost guaranteed to be inspirational, and more than once afterwards, I've gone back to the hotel courts and unleashed the power of direct visual learning on Tennisplayer's famed digital still photographer Mr. J. Gregory Swendsen. It's just hard to believe that every serious player doesn't want that opportunity at least once in his life. But not enough tennis players really know about it, much less how to take advantage. You can't really compare the experience to anything else. If you have read any of my instructional work, you know I believe in direct visual input--it's the way your body wants to learn and it is very powerful in every dimension of the game: technique, timing, tactics, as well as fighting spirit and mental toughness under pressure. (Click here for The Myth of the Tennis Tip.) If you've ever played out of your mind after watching a great match, it wasn't an accident, and you can cultivate it as a regular technique. Then there's the bragging rights aspect--another hug plus. "Yes, when I saw Roger Federer play at Indian Wells in Stadium 2 in 2003, I could see the mark of greatness, and I predicted then and there that he would win many, many Grand Slams etc, etc..." Actually I knew Roger was good, but I had no inkling whatsoever he was THAT good or what was about to happen. But the great thing is that doesn't matter, because in retrospect it's just like fishing, you can tell your story any way you want. I've been everywhere except the Australian and the French--the Open, Key Biscayne, Toronto, even Wimbledon, at a lot of smaller events. The first day of Wimbledon 2003, I managed to walk onto one of the outside courts between matches and get down on my hands and knees and feel, and yes, smell the grass. That was pretty close to a spiritual experience. He may never win Wimby but I don't care, I like watching Henman's classic strokes from close range. Also, you cannot surpass the feeling of sitting in one of the first few rows on Center Court at Wimbledon, wearing your coat and tie. I have had that experience (once). The English really do take that dress thing seriously, by the way. But to say that's a tough ticket is an understatement--I had to speak at the British Tennis Coaches Association conference for two days straight to get it. They don't sell tickets in the regular way in England--and unlike many events you can't scalp them at a reasonable price. (Try $3K and up for a seat on Center Court--I checked.) Someone who is influential in the English LTA either has to owe you bigtime, or just like you a lot. The Open is great and I love New York. That's another kind of pure aesthetic pleasure. Other coaches I've been with don't understand, but sometimes I take a half day off from the matches and just wander around the city looking at the architecture of the buildings. In Key Biscayne, all the players are there and the beach at South Beach is fabulous--for the water and the people watching, and the brie omelets at the News Cafe. But the court set up isn't as great--it's much more of a temporary feeling. Indian Wells on the other hand was built for this event. And on the main point of interest to most recreational players--access to the pros--you can't compare it to any of the other events. Sure the first week at the Open is great. But New Yorkers are tennis fanatics--and there are a few million of them--and they can be rather assertive--so it is far tougher, and frequently impossible, to get a good seat on an outside court with a grounds pass. And if you do fight to get one, you feel like you have to stay put and defend it, no matter who is playing on that court next or whether the match is actually interesting. To be honest, I'm too antsy for that, so sometimes I don't make the effort even if there is a player I want to check out. 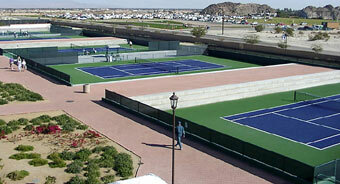 The main walk way gives you an incredible view looking down over the practice courts. At Indian Wells it's a different deal. You can move around at will in the early days, and see a lot more players with minimal to no crush. The practice court areas were designed specifically for your viewing pleasure. There are two public practice courts at the Open but a lot of top players stay off them. At Indian Wells, they can't get away from you that easily--every practice court is wide open and visible. In fact the main walkway through the complex is elevated so that you can look down over the top of the back fence at the players. It's a great angle--like the front row baseline seat you've always coveted in the stadiums, only a lot closer. And for the more voyeuristic among you, here's a further tip. You need a credential to get into the players' dining room--but there's no prohibition on walking through the outdoor patio area where a lot of players and other movers and shakers eat or just hang out. If you have the nerve you can even sit down and act like you belong. For me though there's also something about just being in the desert. Something about the starkness and all that sand where people's front yards should be. It's a different color pallette out there--translucent blues and greens and the sliver and grey of all those jutting rocks they call mountains--not to mention the wild flowers that are usually up in March. Everything gets bright pink at sunset, and if you happen to catch a thunder shower it is wild. On occasion I think that I actually start to feel relaxed. The views are a little different out in the desert. The other cool thing is that the players are much more visible around the hotels and around town compared to say the Open, where some stay near the site and others scatter in Manhattan or hide in private housing. I've actually heard Gustavo Kuerten sing and play the guitar at one of the hotel bars (it was bearable). I've seen Marat a few times, sitting on a corner stool drinking vodka, then heading out to the patio to smoke a few cigarettes. He looks totally unapproachable, but still it is entertaining viewing, and the girls are the European model types. They look even more unapproachable than Marat. But let's see if the new Marat's habits have changed this year. I'm kinda thinking yes. The players also have favorite restaurants. Interestingly a lot of them go to LG's which is a local prime beef steak house. (Stop reading now if you're a vegan or animal rights activist.) I don't care where you've been, you have not seen a large steak until you get to LG's. They start at 20 ounces and go up to several pounds. And I am not ashamed to admit that I have eaten some of the larger sizes. If you've got what it takes, order it "Black and Blue." That's charred on the outside and raw on the inside. It's the only way to eat $40 or $50 of prime beef, if you ask me. J. Greg and I usually start with the equally gigantic martini and then I am forced to acquiesce when he starts to order expensive red wines. 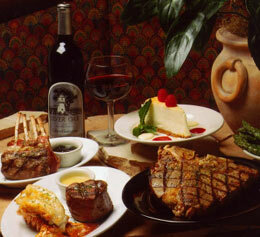 The Indian Wells restaurant scene: a mecca for big beef and red wine. It's not too surprising to see the Spanish and South American players there. 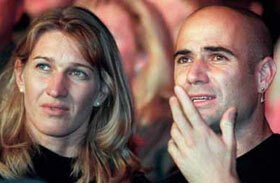 But interestingly Andre and Steffi are also regulars. (Sans martinis and red wine.) One night we happened to get their regular waiter, who told us they were a dream to wait on, if somewhat particular. Andre likes his steak covered in secret spices, and they keep the list written down in the kitchen. The ingredients cannot be divulged. They also like the king crab legs, but the meat has to be removed from the shells by the staff before they serve it. If you happen to know Giancarlo Andreani, our Associate Editor, you know that he is a lifelong Agassi fan. OK, perhaps the word fan is not quite sufficient. 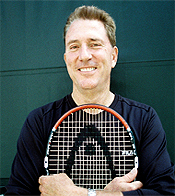 There was a time, as with many young players, when GC wanted to be Andre, a time when he may have occasionally thought he was Andre, and when he showed up in Marin county to play college tennis, with the clothes, the rackets, and the hair, he may have initially frightened some people. Just until they got to know him. He's better now, although Andre's looming retirement could pose a final spiritual test. Once I heard about the secret spices, I would not relent until the waiter agreed to prepare GC's fillet according to the recipe. He had to check with the kitchen, but our waiter finally gave in, though he drew the line on disclosing the actual content of the secret spices. I could live with that. But in return he caved in on the crab legs--so we were privileged to be the only other customers in LG history to have them served at the table with the shells already removed. We all tasted the Agassi steak of course and agreed that one of the spices might actually be clove. Clove on fillet? GC loved it. Who'd imagine Andre would have a taste for the exotic after his well-known love affair with Vegas fast food? If it's warm enough--which is was--the whole place has a retractable roof so you can enjoy your beef while looking at the stars. Now that was an unusual night of fine dining. Particular about their crab legs? LG's may be at the top of the beef chain, but the whole area is absolutely flooded with other steak houses. Morton's is also awesome. But we also found a bizarrely out of place New York-style Italian restaurant called Castelli's a few miles up Highway 111. They play Sinatra and Tony Bennett, and their pictures are all over the walls. The waiters wear cheap tuxedos and talk like very friendly mob guys. The concierge at our hotel claimed Frank himself actually hung out there, but the waiters laughed at that one. Who cares though? The place is swinging and the pounded veal chop absolutely kills. Welby with a couple of recent junior students. Ask him about balance. What does that have to do with Indian Wells? Welby's most famous student was Charlie Pasarell--the man whose vision is behind the event. 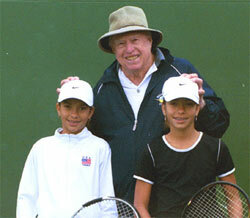 Welby lives in the desert and is Emeritus Professor of Tennis at the Indian Wells Tennis Garden--the club at the tournament site. He still works with a few selected students including some successful juniors. You can see his name on the backboard on the lower practice courts--Welby's Wall. Now Welby's writing instructional articles for Tennisplayer, and working on a new instructional book (Click Here). He's in his eighties, but I learn something about the modern game every time I talk to him. If you see him while you're wandering around the site, stop and ask him about the critical role of balance in the strokes. Maybe you'll see Welby, and we'll see what we see for Tennisplayer. It's guaranteed we'll see some great players, and probably some great matches. And probably some unexpected and entertaining additional events. Stay tuned.